International Starch Institute is approved to work with genetic engineered raw materials. Agrobacterium tumefaciens prefers to live in tumours it creates in the infected plant. The way it takes control is by transferring some of its DNA into the chromosomes of the host. With its own DNA in place it commands the cells to produce hormones leading to the tumours. Agrobacterium tumefaciens is a natural pathogen and the ability to transfer DNA has turned out to be a most valuable tool in bioengineering. The bioengineer starts to change the DNA of agrobacterium tumefaciens itself. The tumour-causing genes are removed, but the infectious behaviour is retained in order to use the bacterium as a carrier of new genes to be inserted into plant chromosomes. 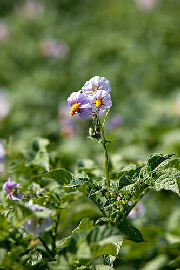 The new genes may be of any origin and are chosen with plant improvement in mind. The desirable genes are spliced into the bacterial DNA and then the bacterium is inoculated on plant tissue - hopefully infecting the cells and transferring some of its DNA with the "improved" genes. "Hopefully", because the success rate is small - so small that finding cells with successfully transfered genes is like looking for a needle in a haystack. The bioengineer therefore introduces a marker along with the desirable genes making it easier to find the cells with these genes. As an example, a marker that makes the cells resistant to a chemical substance would do the trick. All the bioengineer has to do is to add the substance and collect surviving cells. Such a marker may be ideal for the finding but undesirable from an environmental point of view. The marker is therefore chosen with great care. Plants develop from the cells and are multiplied by usual breeding techniques. The bioengineering targets so far has been crops producing its own insecticides, crops resistant to a particular herbicide or with improved keeping qualities etc. More than thirty transgenic crops have been approved for cultivation by USDA and new transgenic plants are in the pipeline all over the world. The agronomist do no longer have to wait until a certain characteristic comes to existence by crossbreeding and mutation - he can now manipulate the characteristics directly at the genes. For the starch industry it opens a New World of opportunities. As most industrial starches are modified to suit various applications the opportunity now is there to tailor the characteristics of the native starch in situ in the plant under control of manipulated genes. This will save traditional chemical modification and most important it will do away with the effluents from such modification - effluents that so far only have been dealt with by energy costly aerated treatment.